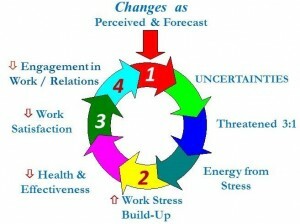 Our 4-stage model of how change typically impacts staff “Can Do” wellbeing & “Will Do” engagement. It’s been said that “The only person who welcomes lots of changes is a baby with a full diaper”. This dark humor captures the truth that, while some degree of change at work is motivating, too much change too quickly in stage one mostly creates preoccupying uncertainties and wheel spinning worries … increasingly threatening both psychological balance and on-the-job involvement at. The two are closely related. 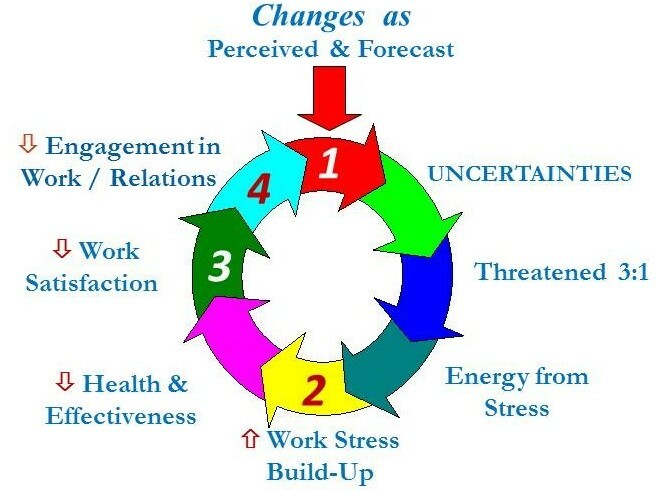 Rising, chronic stress, as shown in our 35 years’ applied research, is the second stage of early warning signs in an unfortunate spiral that can be set in motion. Stress builds up as staff need to stay revved up, both to be ready to do their new or extra work and to “defend” themselves in unfamiliar situations which they often feel as threatening. In this second stage, both effectiveness and wellbeing are gradually drained rather than energized by the high octane hormones of stress. “Can Do” declines. In the third stage, people begin more frequently to ask “What am I getting back from everything that I’m putting in?. Many staff find that while their old work satisfiers have disappeared, new ones aren’t yet in sight or reach. In stage four, with higher stress at work not being offset by new sources of satisfaction, it’s understandable that many look to blame someone. We may sometimes feel like a victim, feeling less positive about our employer and about uncooperative co-workers. So, in stage four, to deal with a sense of being (ab)used, many disengage, pulling back, caring less, and being less involved with their work and co-workers. “Will Do” has begun to evaporate. Our Successful Change model both (a) restores and protects the “Can Do – Will Do” at the heart of productive wellbeing and (b) provides the foundation for the “Let’s Make It Work” team culture essential for organizational changes to work as planned.